I tried to make the setup progress as simple as possible. Unfortunately you are not allowed to distribute the offline files, which are provided by dict.cc. But some of them are also very huge, so it is unexpedient too. To get performance with that amount of data, you can't be loading them into memory each run. You should probably be using an sqlite database. You seem to be re-implementing a lot of Alfred-Workflow, too. Anyway, I pushed a new release which uses a SQLite database. Depending on the query search is faster now. But even if it is slower sometimes, I think the database solution is much better. I had a quick glance at the code. The slowness is mostly down to the use of sqlalchemy, which is big. It's an industrial strength library, not ideally suited to small scripts meant to run fast. I did a little bit of benchmarking, and it takes ~0.2s for sqlalchemy just to import on my machine (old but has an SSD). With Alfred-Workflow, you're looking at a minimum of ~0.1s before your code starts running (0.05s for Python to start up plus 0.05s till Workflow.run() calls your main() function). That means it takes over 0.3 seconds before workflowScript.py even does anything, which is a noticeable delay. To speed it up, I'd consider using peewee instead of sqlalchemy. It's much smaller, so will probably load noticeably faster. I am in urgent need of an alternative to the Leo dictionary workflow, so I found this. python "/Users/David/Dropbox/Alfred Sync Folder/Alfred.alfredpreferences/workflows/user.workflow.9B955379-60E9-4C05-A5BD-D89026DF606C/parseDictsData.py" "/Users/David/Library/Application Support/Alfred 3/Workflow Data/de.nieting.DictCC"
Can you please update that workflow? I also had to run the fixum workflow to even start using the dict.cc workflow. Is there anything that can be done? I really need a reliable german-english translator workflow. I used Leo every day. Looks like you broke the JSON file. I can’t tell if the JSON is invalid if you only post part of it. Now, is there a way to use both directions in this workflow without having to choose the direction first? 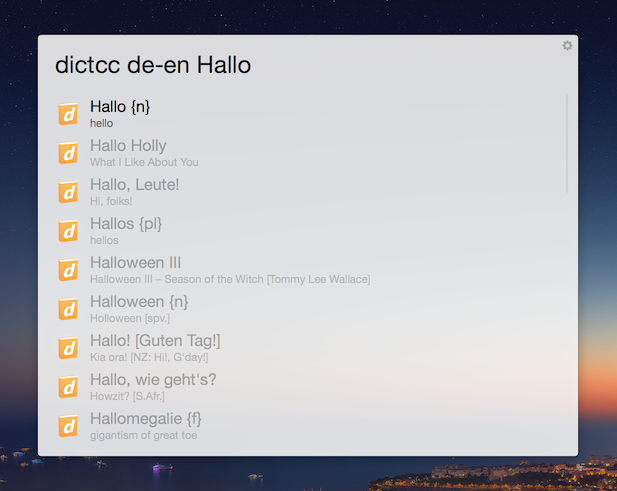 For instance I would like to type in "hello" and "Hallo" and the workflow would detect the language and translate it? Or it would simply display both translations? Oh, right. That was the whole file. I have no idea how the workflow works. I don’t have it. ”supportedDirection”: “both” would indicate it works in both directions. …since the Leo Workflow stopped working (due to timeout) and reading that they asked the workflow to not be published furthermore (see https://github.com/psistorm/alfredapp) I am also looking for an alternative and this works really good. I have a question though: Is there any way to reverse the display within the results list? Looking at the following screenshot, from a UX perspective, I find it irritating that the term I already know (water in this case) is shown large - since the translation "Nass" is really what I'm after. Does anyone have a hint how this would be possible, if at all? Any hint is highly appreciated.